2Wheel Chick: London's Cycle Superhighways - Commuting friend or foe? London's Cycle Superhighways - Commuting friend or foe? London is fast becoming a cycling city. Gone are the days when cycling through the city was the preserve of daredevil commuters and aggressive couriers! Now, we have “normal” people commuting by bicycle. By that I mean the everyday man or woman in the street dressed in civvies, not the slightest snip of Lycra in sight, on a hybrid bike or one of the Transport for London (TfL) bike share cycles. It is great to now have proper traffic-free cycle lanes where you are separated from the traffic. I love being able to ride from the City to Victoria, via Embankment and Westminster on a traffic-free path, also known as the East-West Cycle Superhighway. And so do tens of thousands of other people! 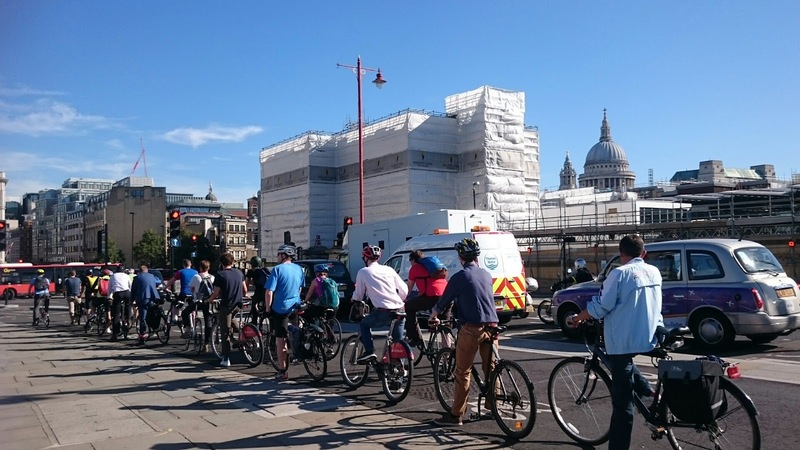 Shortly after this Superhighway (and the first section of the North - South Cycle Superhighway) were officially opened at the end of April this year TfL counted an average number of 1200 cyclists per hour using the East - West cycle route between Tower Hill and Westminster Bridge. 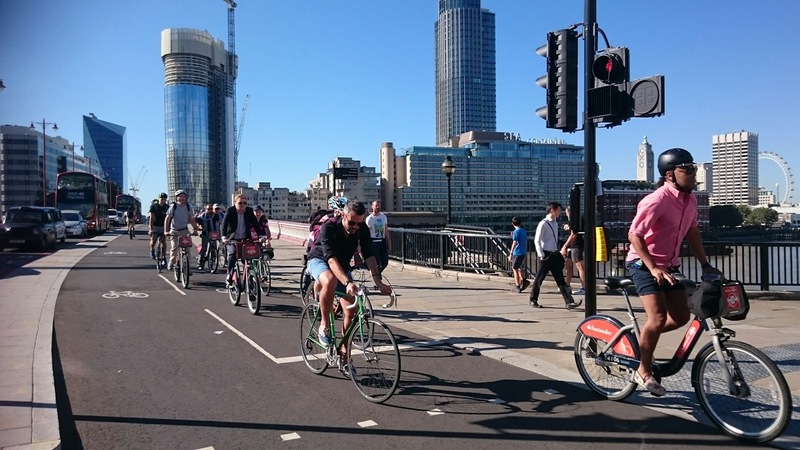 As more people have heard about the Cycle Superhighway, and particularly as the weather has been very pleasant it seems like every cyclist in London is taking to the streets! So that 1200 figure is probably significantly higher! When riding to work I feel like I am part of an unofficial Ride London event, or a Critical Mass ride. In fact sometimes there are so many riders that at places like Blackfriars Bridge or Westminster Bridge you have to queue to get through a couple of phases of traffic lights. You are basically in a cyclists' traffic jam! So yes, cyclists on London's roads are now a feature, almost as ubiquitous as black cabs. Unfortunately cyclists may not always have the same world-renown reputation. People's opinions on cyclists are somewhat chequered - rather like the Uber cars! The perennial criticism of cyclists jumping the red lights and not respecting the Highway Code remains. From what I see the majority of cyclists do respect the traffic lights, and the proportion of bike riders who break the rules is no greater than the number of motorists who do so. However, the thing that is of concern is bike riding discipline among groups of riders. Last week a couple of cyclists were involved in a head-on collision along the East-West Cycle Superhighway near Blackfriars Bridge. The video has been shared widely, and it is clear when you watch it who is to blame. Luckily, no one was seriously hurt - not even the guy who ended up rolling off the segregated cycle lane and onto the main road, which thankfully had no traffic passing at that time. I must admit that this has been an accident waiting to happen. When riding the North-South Cycle Superhighway up through Blackfriars and Farringdon the two-way cycle lane means that sometimes you get some idiot trying to overtake slower riders and then veers into the path of oncoming riders. Sometimes people don't hold their riding line and suddenly swerve left or right and almost knock into riders next to them. I have also seen riders crash into the kerb when going round a corner! Thankfully I have not crashed or been involved in a collision with other cyclists, though I have had to take evasive action when I had a couple of near misses! It is great having these lanes, but is it time for riders to learn a bit about bike handling and riding in groups? Or maybe it is just part of the process when folks get excited about having their own cycle lane, and in time things will settle down. Let's wait and see, and hope there are no serious incidents that will prove the naysayers right.